The Meat-Calculator: How many animals could continue living if you switched to vegetarian diet? How does the environment benefit? A mild summer evening without a sizzling steak or a great burger on the grill? Unthinkable! America is a nation of meat eaters. Actually, Americans have the highest meat consumption in the world. But what does this mean on a personal level? The Meat Blitz-Calculator shows you how it all adds up, based on your personal diet. Like: How many animals have to be raised to satisfy your appetite? How many resources are needed to produce this livestock? 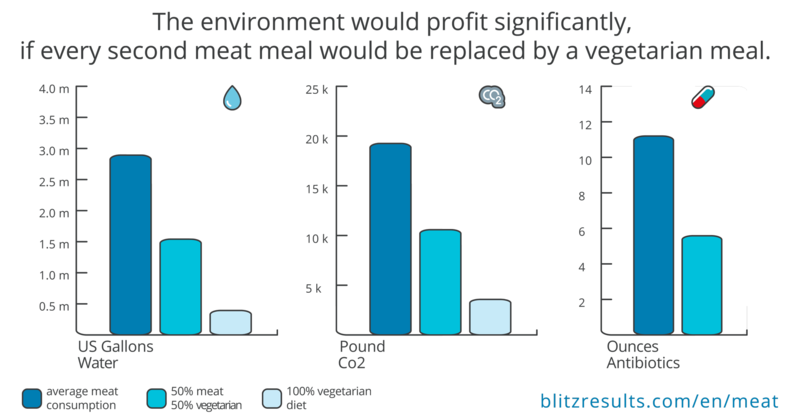 And would the environment and climate profit if meat was replaced by vegetarian alternatives? Stop guessing, use this Blitz-Calculator and find out. 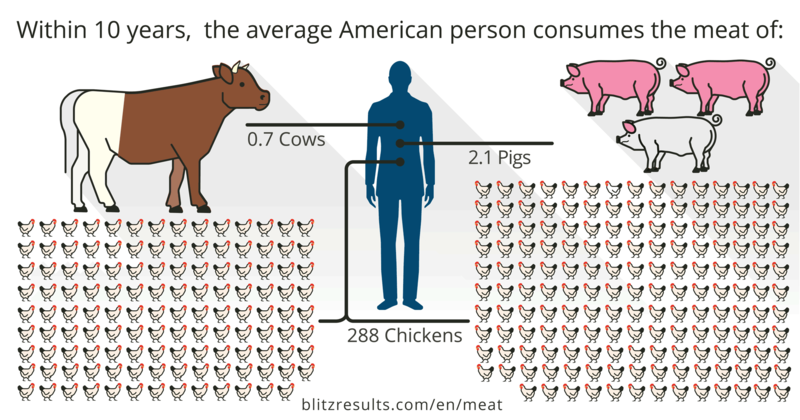 All data used is based on Meat Consumption in the US. Free Infographic (CC). See details. Animals in factory farming are prone to illness. Antibiotics are used as a countermeasure. A total of 30 million pounds of antimicrobials were sold for use on food-producing animals in the United States, which represents 80% of all antibiotics used in the United States. [source: FDA]. This has huge negative side-effects. Last year approx. 23,000 Americans died and nearly 2 million suffered illnesses from antibiotic-resistant bacterial infections and these numbers are increasing. It is difficult to say how many human infections are related to resistance that emerged from animals. But one thing is clear: the more antibiotics we use, the less effective they become. No matter whether applied to humans or for animals, the overuse contributes to the development of dangerous superbugs. Source: Food and Agriculture Organization of the United Nations (FAO), FAOSTAT online statistical service. High meat consumption also has a considerable impact on climate change. On the one hand, grasslands and forests are transformed into fields or pastures. The clearing of trees and humus degradation causes large amounts of CO2 to escape into the atmosphere. In the United States, more than 25% of the total land base is used for pasture and range. In addition, roughly 20% is cropland. If you consider that nearly 40% of the crops are used to feed the livestock, this means that more than one-third of the total land base is solely used to produce meat. Despite these effects on the environment and repeated scandals such as the one related to JBS and Brazilian meat, many Americans are still reluctant to give up meat. Around 85 percent of the population does not want to miss meat products. On the other hand, there are growing signs of a mindset change observable in the US. In 2017, 6% of US consumers now claim to be vegan, up from just 1% in 2014. The same study also states that consumers are showing a growing awareness of the impact of meat consumption and hence are looking for more ethically produced and environmentally sustainable foods. This also applies to by-products like leather that is used for shoes and clothes (e.g. pants). [source: Reportbuyer]. Tofu as an alternative to meat? Many critics complain about the consistency and rather neutral taste of unprocessed tofu. What annoys some people, makes others happy: Due to its almost unspectacular taste, it is suitable for a wide variety of dishes and can be seasoned or marinated as desired. According to personal preference, it can be placed in marinades with garlic, soy sauce, curry, coconut milk or lime juice. It can be grilled, baked, roasted or diced and added to soups. Tofu consists of soaked soya beans, which together with a certain amount of water are ground into fine puree and then processed into blocks of soya. In some cases, it is sold as natural tofu, but often it is further refined with other additives. 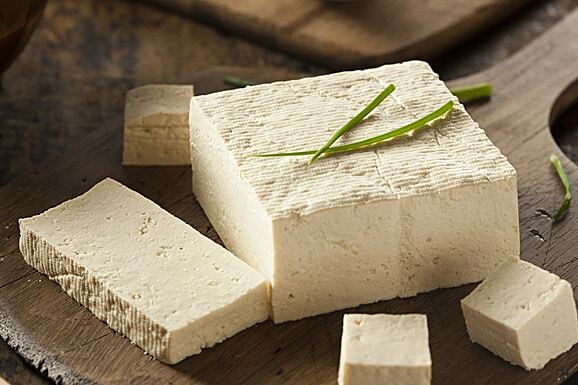 On the shelves of supermarkets, you can often find smoked tofu, which has a strong and tart flavor. Smoked tofu is mostly used as a sandwich topping, in salads, fried with rice or in vegetable dishes. Sausage and ham lovers often concede a strong aroma and taste to it, but do not regard it as a really tasty substitute. Nevertheless, it has enjoyed increasing popularity for years as a vegetarian spread, tofu sausage or soya escalope. In recent years, roasters have also become more and more popular. They are usually made up of tofu/soy products, a wide variety of vegetables or cereals. Particularly popular ingredients are oat flakes, carrots, zucchini, rice, couscous, lentils, millet or quinoa. BBQing is a popular sport. Steaks and sausages are almost always included, even though there are now numerous meat-free grill alternatives. Tofu contains less fat and therefore, your caloric consumption is fewer than when you eat meat. While one serving (4 oz.) of tofu contains about 80 – 120 kcal, the same amount of meat yields up to 350 kcal. Sausage contains even more calories and therefore tends to have a rather negative effect on BMI. Meat has a significantly higher concentration of B vitamins. Tofu contains large amounts of minerals, above all magnesium and calcium. Tofu is almost cholesterol-free. On the other hand, depending on the type of meat, 1 serving meat (4 oz.) contains 70 to 400 mg of cholesterol. The production of meat is much more resource-intensive and has a much greater impact on the environment and climate than the cultivation of soybeans. 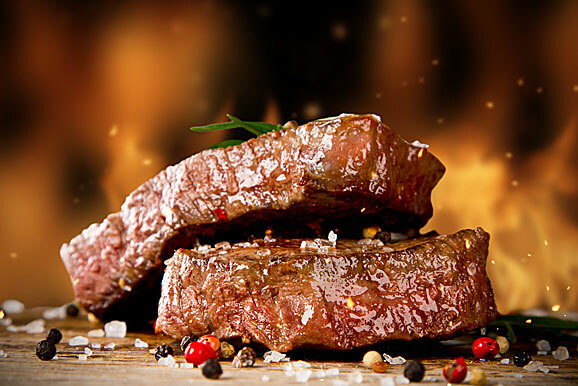 Meat has its own characteristic taste. Tofu, on the other hand, tastes rather bland. The future of nutrition? And how does soy fit in? Meat is sometimes regarded as “the new cigarette”. Experts claim that meat consumption in the United States will decrease in the coming years and decades. [source: NRDC]. However, global meat consumption will increase sharply in the future, as the world’s growing middle class wants to consume more animal proteins. Soy as a replacement will play an increasingly important role in nutrition as a healthy and environmentally friendly alternative to meat. Vegetarian foods such as soybeans sometimes have to face a lot of criticism. 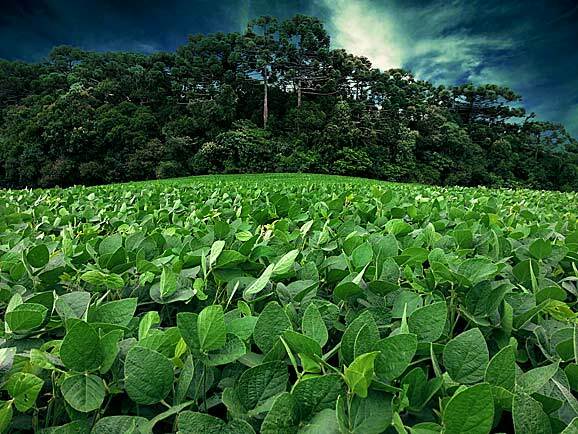 A large part of the soy is grown in South America. In order to gain more land, large parts of the rainforests are converted into farmland by slash-and-burn clearance. Consumers should therefore carefully examine where the soy comes from. Is a vegetarian diet also suited for kids? Both, the American Academy of Pediatrics and the Academy of Nutrition and Dietetics, state clearly that vegetarian and vegan diets are healthy and suitable for children as well [more information about vegetarian nutrition for kids]. But just like for meat-eating children, you need to make sure that your child gets all the essential nutrients to help them grow and develop normally. The meat calculator calculates the resources required for the animal husbandry of one’s own meat requirements. In particular, feed, antibiotics, land use and water pollution are examined. Consumption of meat is estimated for a given amount of years. Standard values such as the average meat consumption are already pre-filled, but can easily be adapted to your own eating habits. In this way, everyone receives their own personal result. In a second step, it is possible to simulate how many resources can be saved by replacing part of the meat meals with a vegetarian alternative. In the case of the meat calculator, tofu was chosen as a vegetarian alternative, since it is probably the best-known and most widespread meat substitute. However, tofu was only used as an example for vegetarian nutrition. It serves as a symbolization and as a vehicle for a thought experiment. Instead of tofu, however, pulses or vegetables could also have been used for a calculation. Nevertheless, tofu is of course only one of many, many possible substitutes for vegetarian nutrition. And there are also many vegetarians and vegans who do not eat tofu at all. At first glance, the meat consumption stored in the calculator seems to be very high and most people estimate their own meat consumption to be much lower. How come? Meat is consumed more often than one might think, unconsciously or due to lack knowledge about the actual meat content of the products. We are often unaware of how much meat the Bolognese sauce, pizza or meat salad actually contains. In addition, there is a phenomenon that nutritional research calls “hidden meat”. For example, gelatin in jelly beans or components of pork, beef, and poultry in potato chips. The pre-filled values for meat consumption during the week are based on the results of the ERS Food Availability (Per Capita) Data System (FADS). Note: It needs to be distinguished between the weight of the meat ending up on your plate (so-called retail weight) and the carcass weight of the animals. The carcass weight means the warm weight of animals directly after slaughter. This means that limbs, innards and the skin of the cow have already been removed. Bones, cartilage, tendons and other inedible parts of the farm animals are still included. On average approx. 60% of the carcass weight is edible. Values entered by you above in the calculator are retail weights. However, the carcass weight is used to calculate the results (i.e. number of slaughtered animals, CO2, water). 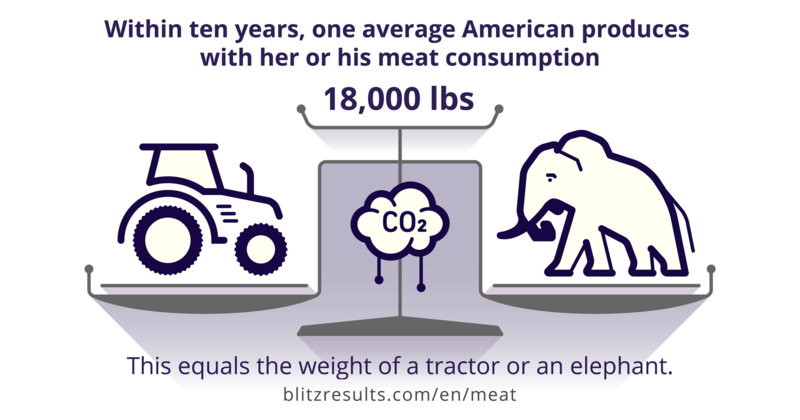 Reference values such as water consumption and CO2 emissions always refer to 1 lbs of meat and are extrapolated from weekly values to ten years. First, the actual meat consumption per year is multiplied in pounds by the tofu content in order to determine the amount of tofu consumed. This is then multiplied by the amount of water required (111 US gallons) to produce 1 pound of tofu and subtracted. The same procedure is used to determine the CO2 emissions saved. 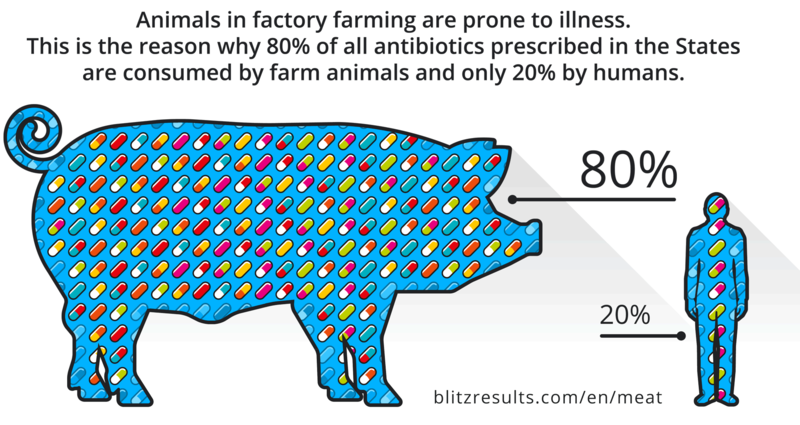 To calculate the number of antibiotic treatments, the number of animals slaughtered is first determined and multiplied by the average antibiotic treatments. The per capita meat consumption of the US Americans is the highest in the world. Production of meat and factory farming cause many problems: feed requirements, use of antibiotics, water consumption, CO2 emissions. Soy is an “efficient” foodstuff and can replace meat in terms of nutritional physiology. It also has ecological advantages. But, for many people, in terms of taste, tofu is not an equivalent meat substitute for many people. The importance of vegetarian and vegan alternatives is constantly increasing. Women are often a little more keen to experiment with vegetarian and vegan food. Nowadays, many discounters and supermarkets already offer a small assortment. Discussions between vegetarians and dyed-in-the-wool meat eaters are unfortunately often still very emotional. Respecting the other person’s diet and way of life is always a good idea. 8 Tofu as an alternative to meat? 10 The future of nutrition? And how does soy fit in? 11 Is a vegetarian diet also suited for kids?